Mohammad Shami's 'sweetheart' dancing to 'Afghan Jalebi' in pool is all you need to see to beat your mid-week blues, viral video breaks Internet. File picture of Mohammad Shami. There are no bigger stressbusters than one’s kids and for someone who had rediscovered himself in the last one year as he returned to the ODI setup of the Indian National Cricket team, amidst sexual harassment charges by wife, it means even more for Mohammad Shami as he saw his little one hit the pool. Uploading a video on his Instagram handle, as his little boy splashed about in the pool, Shami’s caption speaks volumes about his child. Seen beating the heat in the shallow end of the pool, Shami’s son danced to ‘Afghan Jalebi’ from the movie Phantom and looked hilariously adorable. Shami captioned the cute video, “Sweetheart” followed by appreciation emojis. The Bengal pacer had a long-standing case with his wife Hasin Jahan after she came out with screenshots of his alleged affair on social media and accused him and his family of sexual harassment. Last month, the fast bowler was charged with non-bailable offences by Kolkata Police for dowry harassment and sexual harassment cases levied by his wife. On the professional front, Mohammad Shami seems to have made his way back into the Test and ODI setup after suffering personal battle off-field and managed to stay injury-free over the past one year along with improving his bowling skills. Shami is crucial to World Cup which starts on May 30 in England and Wales, having become Virat Kohli’s go-to man in the five-day format apart from getting his momentum back. 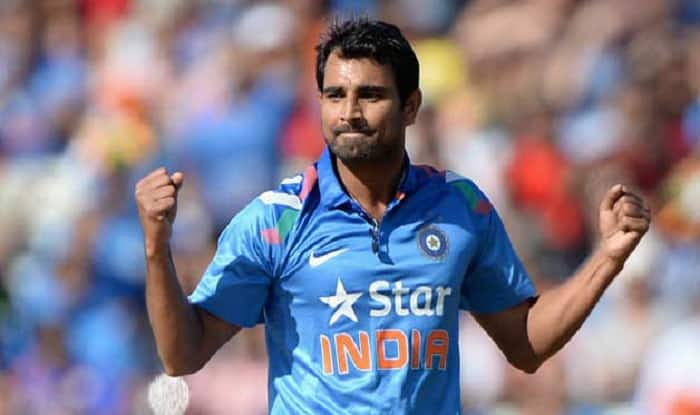 Currently playing in the 12th edition of the cash-rich Indian Premier League (IPL), fast bowler Mohammed Shami has been going through one of the best phases of his cricketing career. Featuring for Kings XI Punjab, Shami played a crucial hand for Kings XI Punjab’s scintillating win over Delhi Capitals on Sunday night.